In the past few months, teacher tenure has been a major focus of debate. The recent court ruling in Vegara v. California and two separate lawsuits in New York have all made teacher tenure a subject of dinner table conversation well beyond the conventional education policy circles. While most of this discussion is centered on challenging tenure provisions in state law, tenure decisions are actually made at the district level and thus districts will eventually be the ones to modify or maintain their current practices based on the results of these challenges. This month's Trendline takes a close look at how districts in the NCTQ Teacher Contract Database are currently implementing key aspects of teacher tenure. 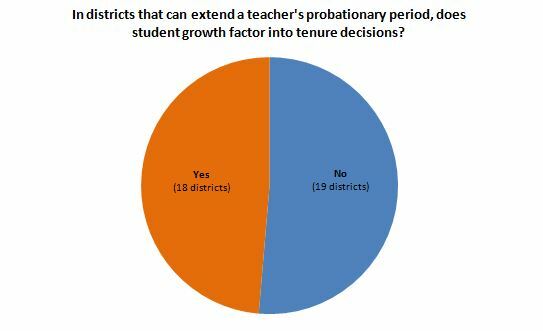 The probationary period, or years of experience a teacher must have in a district before tenure is granted, is often at the center of the tenure debate. Sixty-five percent of districts in the Teacher Contract Database award teachers tenure after they have taught three years or less. Desoto County and Jackson in Mississippi have the dubious distinction of being the only districts that offer teachers non-probationary status after just one short year in the classroom. While Mississippi does not refer to non-probationary status as "tenure", its status has all the same implications of a tenure system. At the other end of the spectrum, Cleveland implements a seven year probationary period for its teachers.Cleveland has flexibility from state law in determining the duration of teachers' probationary period, granted to the district after the Cleveland Transformation Plan was adopted in 2012. The district has a system of limited contracts which make up the probationary period; teachers in the district who were hired after October 2012 are offered an initial limited contract that cannot exceed two years and a subsequent limited contract that cannot exceed five years. Twelve districts and two charter management organizations— all ten Florida districts in the Database (Brevard,Broward, Duval, Hillsborough, Lee, Miami- Dade, Orange, Palm Beach, Pinellas and Polk counties) as well as the District of Columbia, Providence, Aspire Public Schools and Green Dot Public Schools— do not have a tenure policy. Districts in Florida offer teachers annual contracts, while the District of Columbia, Aspireand Green Dot Public Schools have no tenure policy. While Rhode Island districts technically have tenure, state policy requires that teachers who receive two ineffective ratings are dismissed, essentially creating a tenure policy that operates like a system of annual contracts. North Carolina is included as a state without a tenure policy in the graph above; a teacher can receive up to a four year contract if deemed proficient on evaluation. But when talking about tenure, the recent news in North Carolina makes things more complicated (more on that, below). Because districts across the state are battling the state's new tenure law in court, the probationary periods in Charlotte-Mecklenburg, Guilford County and Wake County are included as four years in the chart above, reflecting the districts' policies before the new state law was passed in 2013. An important component of tenure is whether there is flexibility over the timing of the final decision to award tenure after the probationary period is completed. Most district-level board policies and teachers' contracts in these districts (77 percent) are silent on districts' ability to extend the probationary period beyond the minimum number of years in state law. Using information from state policy, we get a more detailed look at the flexibility that districts are allowed with this decision. 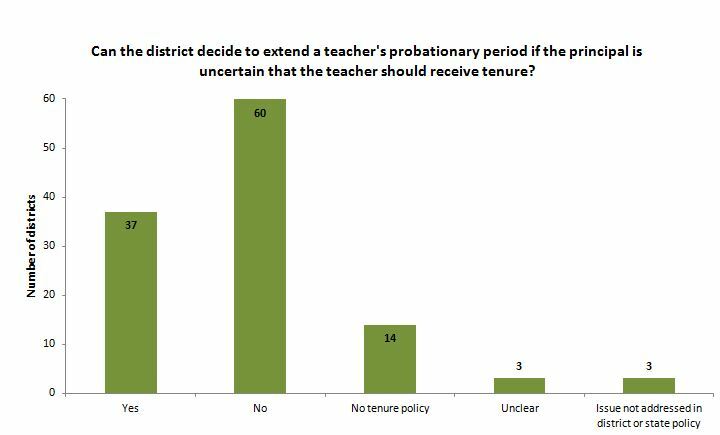 Just over half of the districts in the Teacher Contract Database do not have the ability to extend a teacher's probationary period if the principal is uncertain that the teacher should receive tenure, under state law. 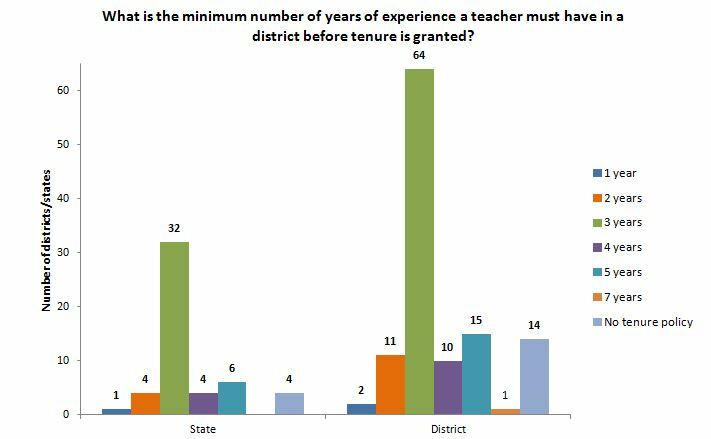 In comparison, about 32 percent of these districts have flexibility over the timing of the final decision to award tenure after the probationary period is completed. Neither district nor state policy in Portland (OR), Oklahoma City and Tulsa address the principal's flexibility over these decisions. Tenure policies in Charlotte-Mecklenburg, Guilford County and Wake County are ambiguous because of arecent court decision in North Carolina that struck down new legislation that eliminated tenure across the state. What happens next with tenure in North Carolina districts is unclear, but school boards in Charlotte-Mecklenburg, Guilford County and Wake County all have passed resolutions opposing the state law due to the ambiguity of certain provisions. Specifically, districts assert that the legislation's requirement to select the top 25 percent of teachers for four-year contracts and $500 annual raises in exchange for their career status is far too arbitrary a process. Guilford County has gone as far as suing the state over the constitutionality of the law. The district was recently allowed a temporary exemption from it until their case is heard, allowing the district to leave tenure in place for those teachers who currently have it, at least for the time being. With the flurry of teacher-focused policy change at the state level in the past few years, it's hard to keep track of what districts are supposed to be doing and when they're supposed to be doing it. Such is the case with student academic growth and its use in making tenure decisions. Based on state requirements, 41 districts base tenure decisions in part on student achievement data, compared to 59 that do not. Although Ohio law does not require that student growth factor into tenure attainment decisions, Cleveland, due to its Transformation Plan, requires its teacher to have positive evaluations— 50 percent of which are based on evidence of student growth— before they can attain tenure. For the 14 districts without a tenure system, all ten Florida districts as well as the District of Columbia and Providence require that student growth is considered when deciding if a teacher continues on in the district.Aspire and Green Dot Public Schools do not have a formal policy on this within their contracts. Which districts have one or multiple pieces of the puzzle when it comes to tenure decision making? Specifically, which districts have both the time and the data to make meaningful decisions on tenure? As any district leader will attest to, more years of student growth data make the information stronger and more accurate. Having a longer probationary period and more years of student data allows districts to have a stronger decision making process for awarding tenure. Of the districts that consider student growth as a factor to award tenure, 15 have a probationary period longer than three years: Bridgeport (CT), Caddo Parish (LA), Chicago, Cleveland, Detroit, East Baton Rouge Parish (LA),Elgin U-46 (IL), Hartford, Jefferson Parish (LA), Louisiana Recovery, Nashville, New Haven, Newark,Orleans Parish (LA) and Shelby County. Additionally, having student growth data could help with the decision over whether or not to extend a teacher's probationary period. While student growth data does not paint a full picture of teacher performance, it is an important consideration in the decision making process as a district decides to award a teacher tenure status. For teachers who struggle in their first year in the classroom and are subject to dismissal based on that data, an extended probationary period could provide more time to show their improvement. In the 37 districts where extensions are allowed, just under half make tenure decisions based in part on evidence of student learning. 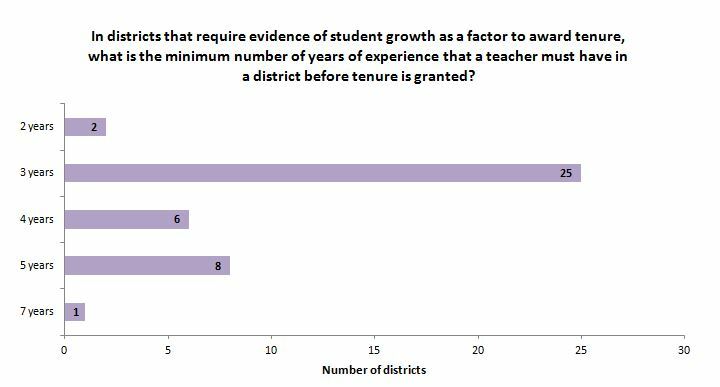 In these districts, principals who are uncertain about awarding a teacher tenure can look to student growth data as an additional piece of information to inform the final decision to either extend the teacher's probationary period or award the teacher tenure status.